Poker is a lot of fun – especially when you’re playing online at Bovada Poker. Math? The mere thought is enough to scare the living daylights out of most people. But if you want to get good at online poker, there’s no way around it: You need to know the odds. Almost every decision you make at the table boils down to knowing the poker pot odds, and knowing which moves will let you scoop up as much of that pot (or lose the least amount) as you can. This isn’t senior-level advanced mathematics, though. You might bump into a few math wizards out there on the felt – wizards like Mike “Timex” McDonald and Chris “Jesus” Ferguson – but as long as you can add, subtract, multiply and divide, you can work out the poker pot odds for every hand you play. You can even do this when you’re in the middle of a hand. All you have to do is learn the following concepts, tips and tricks to turbocharge your Texas Hold’em results. Doing this will also help prepare you to play other games like Omaha and Omaha Hi/Lo when you play poker online at Bovada. No matter what it is you do in life, you’re taking some kind of risk, and hoping to achieve some kind of reward. It could be something as simple as buying a gallon of milk, or something as complicated as deciding whether to have gall bladder surgery. To get the most out of life, you need to figure out ahead of time what the risks and the rewards are. Then you can decide what course of action to take. While it’s good to know your odds of getting dealt a pocket pair pre-flop, it’s even more important to know your odds of completing a hand post-flop. Let’s say you’ve been dealt Ten-Nine of Hearts and the flop comes King-Seven-Deuce with two hearts. You’ve got a flush draw. What are your odds of hitting your flush by the river? Well, there are 13 hearts in every standard deck of 52 playing cards. You have four of them in your hand already, leaving nine for you to catch. We call those nine cards outs; in this situation, you have nine outs to a flush. And there are 47 cards left unseen – that’s 52 minus your hole cards and the three community cards. So the odds of the turn card being a Heart are 38-to-9, or just a little over 4-to-1. What if you don’t hit your flush on the turn? There’s still one more card to come, and this time, the odds of making that flush are 37-to-9, since there’s one fewer hidden card to worry about. So, to figure out your odds of completing your flush draw after the flop, you add the odds for a turn heart and a river heart together – making sure to discount the times you get a heart on both the turn and river. This is obviously not the kind of math you want to be doing in the middle of a hand. The answer in this case is 1081-to-380, which works out to 35.2%. You’ll probably find it easier to use percentages; you can even memorize this number ahead of time, but you’ll also need to know your odds for other situations, like when you have an open-ended straight draw and eight outs to complete, or two overcards and six outs to make top pair. While it can be done, we’re going to show you a handy shortcut you can use instead to make a close approximation at the table. Before we get to that, let’s bring our attention back to the pot odds. These odds have nothing to do with the cards that have been dealt; now we’re talking about the ratio between how much money (or chips, if you’re playing poker tournaments) there is in the pot, and how large a bet someone has made in front of you. If there’s $100 in the pot and somebody bets $20, that means you have pot odds of 100-to-20, or 5-to-1, when you’re considering making the call. That’s 20% if you want to stick with percentages. Why is this information useful? Again, a sound poker strategy is all about assessing risk versus reward. In the above scenario, your odds of completing a flush draw by the river are 35.2%, while your pot odds are 20%. In theory, that makes it worth the risk for you to call – provided you get to see both the turn and the river. The reward is bigger than the risk. Keep in mind that we’re using these percentages somewhat loosely. There will be times when you complete your flush, only to get beaten by a bigger flush. And there will be times when you don’t complete, but you still wind up with the best hand on the river. That’s why working things out to the nearest decimal point isn’t important. The idea is to make a quick and reasonably close assessment of how strong your hand is at any one point in time. To make this exercise easier to understand, think about your hand strength in terms of equity. That’s the share of the pot you can expect to claim in the long term, based on your chances of winning the hand. If you’ve got the aforementioned flush draw, your odds of winning the hand are somewhere around 35.2%, and so is your pot equity in terms of a percentage. If the pot is $100, your equity in dollars and cents is $35.20. The concept of pot equity is useful because it helps you make clearer decisions at the table. Anytime your equity in a hand is over 50%, you want more money to go into the pot, since you’re likely to win the majority of the time. That gives you incentive to make a value bet when it’s your turn, hoping to get called or even raised. If you have very little equity in a hand, folding is usually your best option. Bluff-raising is usually best when you have at least some equity to back you up when your opponent doesn’t fold. And calling is often the right choice when you have a decent amount of equity – plus the right pot odds to continue. Now we get to that very useful shortcut for figuring out your pot equity. Once you know the number of outs you have, all you need to do is remember the Rule of Four and Two. If you’re on the flop, take your outs and multiply by four to get the odds (as a percentage) of completing your hand by the river. If you’re on the turn, take your outs and multiply by 2. That’s all there is to it. Remember that flush draw we were talking about? You have nine outs on the flop, and nine times four equals 36. That’s close enough to 35.2%. This shortcut works no matter how many outs you have, although the approximation gets a little fuzzier as your outs increase. Again, don’t worry about it too much. Just make sure you count your outs correctly. You don’t want to miss any; maybe you have an overcard and/or a gutshot as well as a flush draw, giving you even more outs and more pot equity. 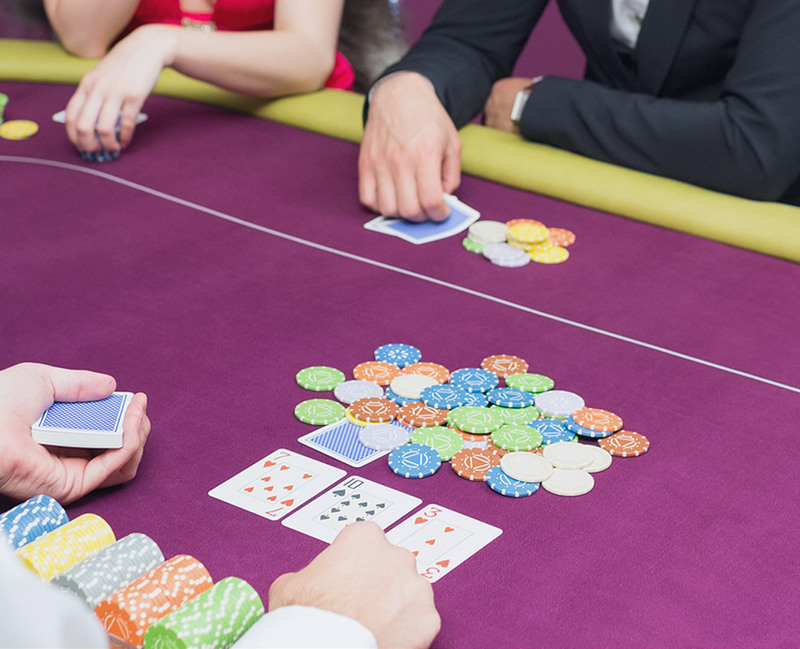 Once you understand the general concepts of pot odds and pot equity, and you’re familiar with counting outs and using the Rule of Four and Two, you’ll have the tools you need to make better-informed decisions at the poker table. In the meantime, here’s a list of odds for completing most of the draws you’ll have on the flop, whether you’re playing cash games or poker tournaments at Bovada. Get to know these odds, and as always, best of luck on the felt.